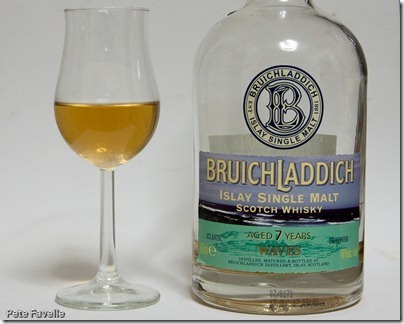 This week’s whisky is another Islay, this time a younger, easier drinking dram from Bruichladdich – the seven year old Waves. 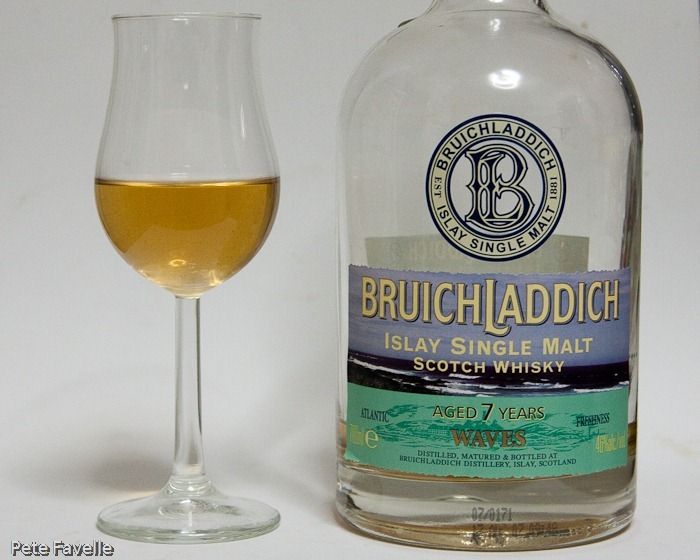 Fiercely independent since it reopened back in 1991, Bruichladdich produce an impressive range of different whiskies, which makes it hard to pin down their ‘house style’. Waves is relatively lightly peated and is a good introduction to their easy-drinking side but they also produce some huge whiskies like the Octomore (which was, at least at one point, “the most heavily peated Single Malt Whisky in the world”). Think of them, if you will, as the Brewdog of Scotch. Although not directly influencing their whisky, it’s also worth pointing out that their Open Day during Islay’s Feis Ile – the week long Whisky and Music festival – is easily the best day out of the week. With only seven years in the cask, Waves is a pale straw coloured whisky coming in at 46%. It’s quite light and sweet on the nose, with vanilla and some slight summer fruit but the alcohol is a little overwhelming. A splash of water smoothes that out, brings a slightly drier wood smell into the mix and makes the gentle smoke a little more apparent. In the mouth it has an almost fudge-like sweetness at the start, fading out as a real burst of heat spreads. The Islay peat is under there but it’s a subtle understated note rather than a huge, aggressive bonfire in the glass. With water the sweetness is tempered a little with some sea salt, but that warming heat isn’t mellowed at all. If I might borrow a term from the world of beer, Waves to me is a proper session whisky. It’s not something that’s easy to have a single glass of; it’s meant to be enjoyed glass by generous glass over the course of the evening. My only real concern is that now I’ve finally let myself finish the bottle, I need to see if the new Waves – apparently slightly tweaked and no longer with an age statement – lives up to it’s predecessor. Some whiskies are great because the smell and the taste of them instantly transport me to the warehouses where they sat and silently matured. Waves doesn’t do that. Waves transports me instead across the road from the distillery and onto the shores of Loch Indaal. I can’t think of many better places to be. There was an amazing programme on Radio4 about this distillery a couple of years ago. [In perhaps inaccurate summary] The chap who now runs it came across the whisky as a wine merchant, decades ago, loved it, and wanted to restore the distillery to its former glory. From dim recollection, he made an annual pilgrimage there, offering to buy it every year, and was refused. After a decade of trying, they agreed, and he went to Scotland to raise the money and sign the papers whilst his wife was in hospital in England giving birth (with no knowledge of the transaction). They lived happily ever after at the distillery. Have been wanting to try it since. Now I really must seek it out. Ooooh — just found the clip here http://www.bbc.co.uk/radio4/saturdaylive/saturdaylive_20080202.shtml — he tells a more compelling tale!